Notes: Also known as Hauge Lutheran Old Church. Before 1850 the pioneers of Perry Township had no way of liturgical worship.. In 1850 the congregation relied on circuit preachers. 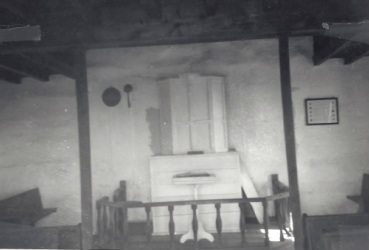 On March 28, 1851, the first formal Norwegian worship was held. The congregation decided to build a 20’ x 20’ building. The building was comprised of logs and constructed in 1852. During its early years dissension grew among the members over the form their worship should take. Those who were interested in change to a less formalized service before they left Norway and were followers of the Haugean Movement and those who wanted the formal “high-church” style of the state church of Norway. At a meeting held in November of 1854, the faction loyal to the State Church of Norway voted to form its own congregation. 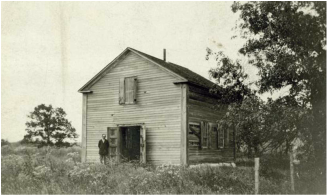 The settlers who chose to remain with the 1852 congregation affiliated with the Evangelical Lutheran Church in America and later became known as the Hauge Congregation. 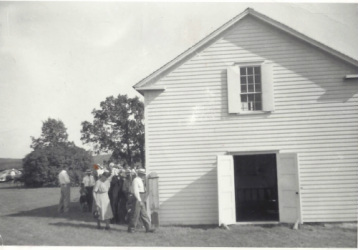 In 1927 the original 1852 church building was restored. The church is on the National Register of Historic Places.